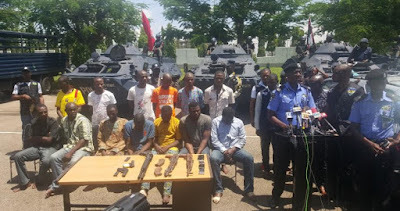 Five persons suspected to be involved in the April 15 bank robbery and killings in Offa, Offa Local Government of Kwara State, were yesterday arraigned before an Ilorin Magistrates’ Court. The court sat to deliberate on the Kwara State Director of Public Prosecution (DPP) legal advice on the case. The DPP said the robbery suspects have a case to answer. Kwara State Police Command OC Legal Kunle Iwalaiye had said the case was for mention and consideration of the Kwara State Director of Public Prosecution’s (DPP)’s letter. He added that the suspects had cases to answer in the DPP’s advice dated 11th of November, 2018. He said the DPP also directed the police to carry out more investigations with a view to arresting more of the suspects on the run. Counsel to the accused, Abulrasheed Lawal, announced his withdrawal from the case based on legal misconception. Said he: “On our part we have a letter before the court dated 21st of October, 2018. The letter is as a result of a misconception of the legal representation of all the accused persons by Abdulwahab Bamidele. “The letter is seeking the leave of the court to withdraw the appearance of Abdulwahab Bamidele (Esq) as counsel representing all the accused in this case. And also my humble self holding the brief of Abdulwahab Bamidele from the record of the court. In his short ruling, Magistrate Bio Salihu granted the prayers of the accused persons’ counsel and ordered the discountenance of their appearance in the case. He equally directed the police to take necessary action for the proper arraignment of the accused persons in court. He subsequently adjourned the case till December 6, 2018.